Liverpool band Rory Storm & the Hurricanes are most famous as Ringo Starr's group before he joined the Beatles. In fact, to most rock fans, that's about all they're known for. They were, however, an extremely popular Merseyside group in the early '60s that did their part to get the Liverpool scene going, and were, in fact, more popular than the Beatles themselves in 1960. Like the Beatles and some other Liverpool groups, they went to Hamburg and played challenging residencies in that city's tough clubs. But, shortly after the Beatles and Storm had cut their teeth in Hamburg, the Beatles shot past Storm and his group in popularity. And with good reason -- the Beatles were better musicians and, unlike Storm and the Hurricanes, wrote their own material. Continuing to play for a few years after the Beatles poached Starr in August 1962 to replace Pete Best, the British Invasion boom almost passed Storm by, although he did get to release a couple of singles in 1963-1964. Storm, born Alan Caldwell, formed Rory Storm & the Hurricanes in Liverpool in 1957. 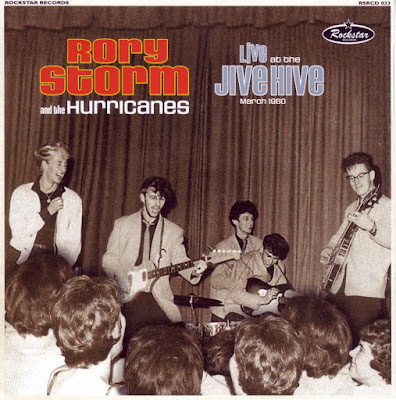 Originally calling themselves the Raving Texans, they changed their name to Rory Storm & the Hurricanes in 1959, taking on Ringo Starr as their drummer the same year. As the lead vocalist, Storm was known as an excellent showman, climbing up pillars to balconies. They were by some estimations the most popular band in the embryonic Liverpool rock scene as the 1960s began; they even managed to appear on the same bill as Gene Vincent in a 1960 concert at Liverpool Stadium, which was the biggest rock show that had ever taken place in the city up to that time. The Hurricanes became friendlier with the Beatles while both bands were playing in Hamburg in the early '60s, and on October 15, 1960, there was even a crude vanity press recording made in Hamburg featuring Starr, the Hurricanes' Lu Walters on lead vocal and bass, John Lennon, George Harrison, and Paul McCartney (Pete Best, the Beatles' drummer at the time, did not participate). Three songs, "Summertime," "Fever," and "September Song," were done at this session, and a few acetates were pressed as souvenirs, although none of these have surfaced subsequently, even as bootlegs. Guitarist Johnny Byrne of the Hurricanes recalled in a 1996 interview that some rehearsal tapes of Rory Storm & the Hurricanes, with Starr on drums, were made, but erased. In early 1962, Starr left the group for a while to play in Tony Sheridan's band in Hamburg, but had rejoined the Hurricanes that summer, when they were playing at Butlin's holiday camp in Skegness. He had become friendly with the Beatles during the Hamburg stints, and on a few occasions had sat in with them on drums. In mid-August 1962, he was asked by the Beatles to replace Pete Best, an invitation he of course accepted; he was a better drummer than Best and, just as importantly, far more compatible personality-wise with the Beatles' attitude and sense of humor. Starr was replaced by Gibson Kemp, later to play in Paddy, Klaus, and Gibson, and to marry Astrid Kirschherr, who had been engaged to original Beatles' bassist Stu Sutcliffe before Sutcliffe's death in early 1962. Incidentally, Paul McCartney of the Beatles was the boyfriend of Rory Storm's sister, Iris Caldwell, for a while around this time. 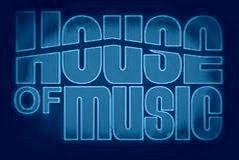 Yet this wasn't the end of Rory Storm & the Hurricanes, although their position on top of the Merseybeat hierarchy was rapidly sliding, not just in light of the Beatles' meteoric rise to international stardom, but also as numerous other Liverpool bands scaled the British and then American charts. In the meantime Storm couldn't even get a record deal, although he and his band did record three tracks for the mid-1963 compilations This Is Mersey Beat Vol. 1 and This Is Mersey Beat Vol. 2. The British independent label that had issued these compilations also put out a single of two of these numbers, "Dr. Feelgood" and "I Can Tell," in late 1963. These, however, illustrated at least part of the problems Rory Storm & the Hurricanes had in competing with other British groups by this time: their repertoire consisting wholly of covers of early American rock tunes and popular standards (on the compilations they had also done "Beautiful Dreamer"), and Storm's high-pitched, nervously quavering voice lacked power and presence. Yet Rory Storm & the Hurricanes did have one last shot on disc, putting out a single, "America"/"Since You Broke My Heart," in late 1964. Interestingly, this was issued on Parlophone, the Beatles' label, and produced by Brian Epstein, in his one and only venture into record production; in addition, Ringo Starr was at the session and added some miscellaneous percussion and backing vocals. Whether Epstein and Starr got involved with this single because they felt bad about Starr's defection from the group and Storm's failure to follow the Beatles into stardom is unknown, but in any case the record didn't do well. Storm's band was quite instable and went through numerous lineup shuffles in the post-Starr years. In addition to not writing any of their own material, they suffered a further handicap: Storm apparently was uninterested in even learning new covers, playing much the same stuff in the mid-'60s as they had several years earlier. Rory Storm & the Hurricanes finally broke up in 1967. Rory Storm later became a disc jockey, but died under mysterious circumstances in September 1972. He was found dead in his house after combining alcohol with sleeping pills. His mother was also found dead in the home, leading to speculation that the pair had decided to commit suicide together. 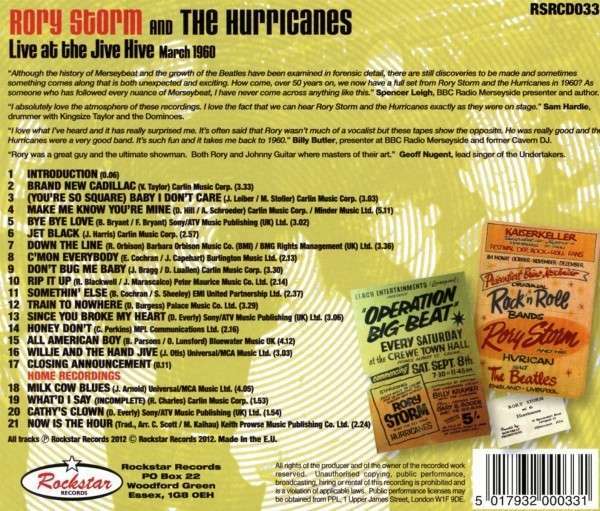 All five songs that Rory Storm & the Hurricanes released were included on an unauthorized compilation, The Complete Works, in the mid-'90s. It is also known that they did three unreleased songs ("Lend Me Your Comb," "Green Onions," "Talkin' 'Bout You") in 1963, and also recorded a couple of songs at Abbey Road Studios in 1964, "Ubangi Stomp"/"I'll Be There," that were not issued.